Do you have trouble putting your hands on that particular colour of fur or tinsel? Do you find yourself getting frustrated searching through your old shoe box for the peacock herl or chenille every time you attempt a new pattern? Do you despair of ever tying flies with the speed of a professional? I had these problems once, but no more! 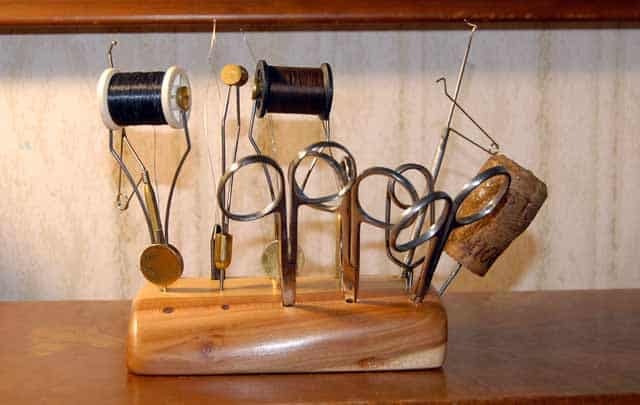 Fly Tying Materials online. I decided to set aside a purpose-built fly tying area. I’m pleased I did. Now I can see a pattern in a book or magazine and within a few seconds have all the materials laid out ready to start tying. If you have young children, you need to be able to lock everything away out of sight where little ﬁngers couldn’t reach it. But I didn’t want to waste a great deal of time setting up before I could start tying. Using an old-style roll top desk really makes fly tying much more enjoyable. The best this is that you can simply pull down the desktop and everything is hidden. Keep all materials in plastic containers. This keeps things separate and easier to find. I have one plastic “box” for furs, another for small hackles, and yet another for tying threads and so on. Plastic containers are ideal. They keep out destructive insects and are cheap and easy to come by. I label all mine. This makes finding the right materials even quicker. I still stick labels on even though the containers are clear plastic. It just makes that aforementioned search that little bit shorter. I used a piece of old plum tree wood to make a desktop holder for my fly tying tools. Not only does it make finding tools faster, providing you put them back in their holes each time you finish using them, it looks good too. 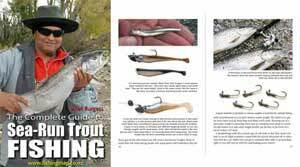 speed up the tying process. If I’m tying a dozen “yellow-rabbits” for example, I’ll cut and trim 12 lengths of fur, layout 12 hooks, and so on, all in the same tray. By placing these in the large white-bottomed tray I can still quickly pack everything away at short notice. On my return, I can immediately take up where I left off. It is amazing how much extra enjoyment comes from a well-organised tying kit. It is now a real pleasure to open the desk lid and zap together a couple of streamers or saltwater concoctions, where once it took ages just to get started. When I first used Leo Wronski’s method, I too found it awkward. But persevered and now wouldn’t tie ﬂies any other way. It speeds up the whole operation enormously, especially if used in conjunction with laying out your prepared materials in batches as described above. Being good at losing ﬂies, I’m now just as quick at tying replacements.